The Apple Watch can be an amazing thing to have when it comes to catching phone calls, texts, and emails as they come in. With it, you can leave your phone in your bag or purse, or just charging across the room, and still keep up with notifications as you receive them, as well as know when you receive important calls and texts. While the Apple Watch does offer some functionality for handling those notifications and calls, sometimes you’d much rather chat on your iPhone than on your Apple Watch or answer a text using the keyboard on your phone rather than dictation through Siri. For times when that happens, here’s how to transfer something from your Apple Watch to your iPhone. 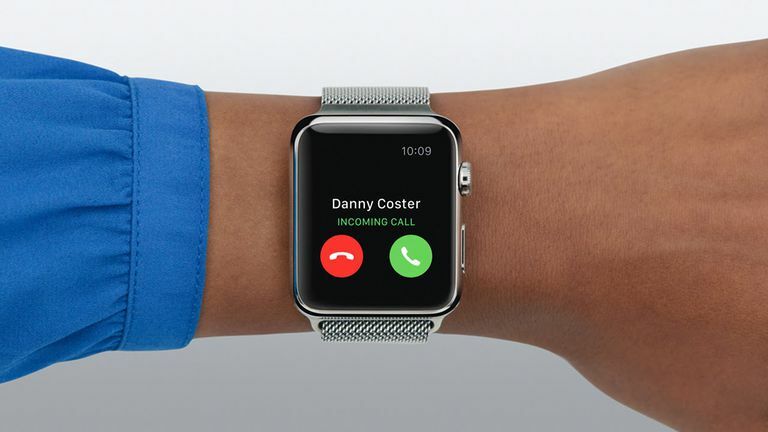 If you see a call come in, but are too far away from your iPhone to grab it in time, you can still answer it on your Apple Watch and then pick it up on your iPhone. To do that, use the digital crown on your Apple Watch to scroll down on your Apple Watch screen to the Answer on iPhone button. Select it, and then the call will be answered, but the caller will be put on hold until you grab your iPhone. That hold won't last indefinitely, but it will buy you enough time to make it to the kitchen where your iPhone is charging. If the reason you didn’t answer on your iPhone is you’re having trouble finding your phone (that's often our problem), there’s a ping option on the screen as well. It looks like an iPhone with vibration lines beside it and will have your phone make a noise so you can locate it. This feature will work even if your phone is set to silent (thank goodness!). If you want to go ahead and answer the phone on your Apple Watch, you can still transfer it over to your iPhone once it’s convenient. To do that, swipe up on the screen on your phone from the Phone icon that will be on its lock screen. That will take you directly into your call. If your phone is unlocked when the call comes in, you can transfer it to your iPhone by tapping the green Touch to return to call bar that will be at the top of the screen. The speaker on the Apple Watch can be great for a really short call, but if what you thought was going to be a short call turns into an epically long one, then this is a feature you'll definitely want to try. In general, there’s not a ton of need to transfer texts from your Apple Watch to your iPhone. Text messages will be the same on your Watch as they are on your iPhone, so when you open the Messages app, you’ll be able to easily tap into the message you want and start typing. It can be nice to get to them a little faster, though. When a message comes in for the first time, you can save a little time by swiping up on the Messages icon on the lock screen on your iPhone. That will immediately launch the Message app and take you to the text you just received. The same trick also works for emails that come in through Apple’s Mail app. In both cases, if your iPhone is unlocked at the time, you can double tap the home button and bring up either the Message or Email from the multitasking screen on your ​phone as well. Depending on what you have going on, that might be slightly more difficult than just launching the app — but it might be a feature that makes things a little simpler for you as well.